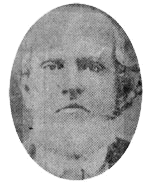 George W. Rider received the meager amount of twenty-nine votes when he was elected sheriff by the voters of Hamilton County in March of 1864. Although the number of votes was small, only seventy-five voters actively participated in the county-wide election. Union troops occupied the city from September 1863 and as Confederates left the county, the civilian residents wanted civil control rather than federal law. The Presidential Election of 1864 posed serious questions for Tennesseans. Not certain as to whether they were a part of the Union or not, citizens met in Chattanooga in June of 1864 to choose delegates for the National Union Convention. The convention obviously considered Tennessee to be in the Union since Andrew Johnson’s name was accepted as the Vice-Presidential nominee. When Lincoln and Johnson were elected, another convention was called to nominate a new governor for Tennessee, slavery was outlawed, and secession repealed. Reconstruction politics had begun with a new reconstructionist governor.